The 8th month of the Islamic calendar is the holy month of Sha’baan. It is a month filled of favours, blessings and grace of Allah. It also contains a great blessed night, the Laÿla-tul-Bara’at (Night of freedom, in urdu “Shabbé-Bara’at”) which is the 15th night of this sacred month. It is also called Laÿla-tun-Niswfé-Sha’baan (the night of the half-Sha’baan). The word “sha’baan” means Share and distribution since Allah ta’ala makes the distribution with his creatures, of the different things essential to their existence, like life (hayaa), death (mawt), food (rizq), forgiveness (maghfirat), etc… and this for one whole year, until next Sha’baan. According to a hadith shareef of Daarmi, Hazrat Anas bin Maalik (r.a) reports that the holy Prophet specified that this month is called Sha’baan because in this month, Allah ta’ala distributes many thawaabs to the mu’minns (believers). And according to a hadith of Baÿhiqi shareef, Hazrat Bibi `Aïsha Siddiqa (r.a) reports that Nabi-e-kareem observed many rozas nafils and many ibaadats during the very month of Sha’baan. The reason is that the holy Prophet precised that the actions of the believers go up towards Allah ta’ala during this month there and that he likes that when his actions arise in front of the Creator, he is meanwhile in the state of roza (fast). Hazrat Anas bin Maalik (r.a) also reports that since then, as soon as the moon of Sha’baan is visible, the sahabas (r.a), to imitate the holy Prophet , began also to practice by achieving more rozas nafils, namaz nafils, tilaawat-ul-Quraan, charity towards the poor and other good deeds (‘amal). The very day of the visibility of the moon of Sha’baan, accomplish after the namaz Isha, 2 raka’ats nafils. 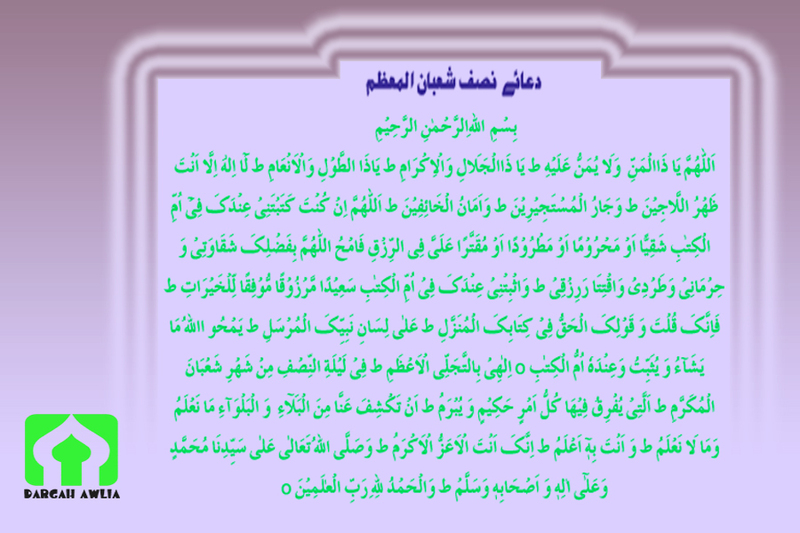 In each raka’at, after sourah al-Faatihah, read 3 times sourah al-Ikhlaass. After the salaam, read 100 times Darood shareef and made your du’as, among which, that Allah ta’ala gives us health and courage to make well the ibaadats (acts of worship) during the month of Sha’baan and after.